I grew up in the Rocky Mountains hiking pretty much every day, whether it was the mile to school or all over the trails during the summer. We didn't call it 'hiking' then - it was just playing and getting from one adventure to the next. Hiking is a tremendously healthy experience that exercises your body, mind, and soul - and the best thing is that just about anyone can do it, no matter location or age. Now, I camp, backpack, and lead others on frontcountry and backcountry outings to share my skills with them. The most enjoyment I get from life is watching a youth that has pushed himself to do more than he thought he could. Not watching him push himself, but watching him when he encounters the next challenge, or the next - he no longer doesn't think he can do it; instead he figures out how he can do it. Self-confidence and solid skills are two invaluable things us old guys need to pass on to the young ones. I put together this web site as part of the Outdoors Dudes group of sites to share expertise and encourage others to get out there and move. I hope the advice, tips, and words of experience you find here make your wanderings more fun, safe, and fulfilling. 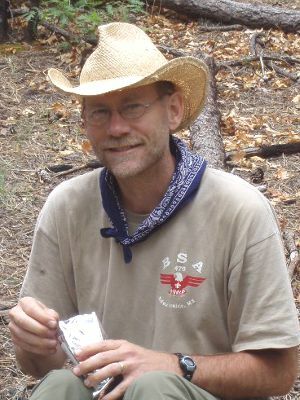 Having just celebrated my 50th birthday in 2011, and passing my Scoutmaster duties for a large troop over to another volunteer, I'm starting a new personal adventure of long distance hiking the country's National Scenic Trails. I won't be setting any speed records or doing extreme physical challenges, but I do want to share my evolving story so other normal folks can see it's not too difficult to get out and explore. I say normal because many gear manufacturers and such love to be part of exotic, extreme, epic adventures, but I think they miss the fact that 99.9999% of their market is just normal guys like you and me. I hope you decide to join me, both virtually through this site as well as physically on the trail when I hike by your community. See my Hike Schedule to get an idea of where I hope to be on the trail. The stages of preparation, hiking, and reflecting for each hike means this site will have an active blog for the next few years. I sincerely appreciate it when you tell others that you enjoy a post or learn something new. The most fun for me is having you leave a comment on a blog entry, so please don't be shy! Enjoy my site and I'd love to hear about your hiking adventures. If you have questions or suggestions, or want to know more about me, or just want to say 'Hey! ', use the Ask Hiking Dude link at the bottom to drop me an email. Matt, Thank you! I look forward to meeting some ATA folks on the trail or in trail towns. I've already e-met a bunch of nice, helpful people. Just found your site thanks to some friends. I'm a Scoutmaster too, and am planning a thru of the AZT in the next year. Have you considered hammock camping as part of your trek? Let me know. I just published a book on hammock camping and would be glad to send you a copy to review for your trek. Let me know. Derek - Hammocks in the desert don't seem like a really good idea to me. I'll also be hiking the Ice Age Trail this year, much of it through the forests of Wisconsin. But, even then, there are many miles without trees so I'd be on the ground. I've heard (and read) a lot of good things about hammocks - comfort, rain protection, bug protection, leave no trace, but haven't gotten past the need for trees. Ed just sent out a great post of Facebook about you and your hike. Congratulations, what a cool site and adventure. If you ever get up in the Cascades up in Washington, let us know. I look forward to following your adventure! Been thru all your site, for my first Hike to the EBC(big one for a start) but i've been following your site and Am confident of my Trip. Will post my exp as i return this month end. Thank you for the SITE. Jagan. Great site. Thank you for putting all this great info in one place. I want to start off by saying "thank you" for what you're doing. I happened onto your site a few days ago looking for hiking information (awesome site). I am new to hiking and you have helped me a great deal already. Thank you for your involvement in BSA and our youth. Your accomplishments and goals have inspired me to get back into Scouting (former Eagle) and to make a difference. Please feel free to contact me. Just discovered your site, it looks great! I've been a hiker since the age of 12(man, that was several decades ago! ), usually hike 3 out of 4 weekends. If you're ever in the San Francisco bay area and would like to hike in Marin county-home to Mt. Tamalpias and Point Reyes National Seashore-give me a holler, I have plenty of fantastic loops to share! I live in Florida, and your right about snakes. Last Trip through Ocala National Forest right on the trailhead of Jupiter Springs 4ft Diamondback. Great trip don't underestimate this trail. Water carrying can be grueling and would recommend 1.5 pct more water than normal due to the humidity year round on long hikes. If you want to go give me shout. @Isobel - Use the "Ask Hiking Dude" link at the bottom of the page to contact me directly. @Jake - I'd be happy to answer specific questions you have through email. But, I tried to put everything of general use into my journal. The eastern half is challenging for camping spots, is more open on roads and fields, and there's little shade. The western half is more wooded, fewer towns right on the trail, and more sections of less maintenance. The entire trail is practically flat and easy hiking, no elevation or PUDs. Be prepared to see very little more than 100 feet away for miles on end. Since it's flat, and the forests are thick, there are long sections with no view except the trees around you. Mentally, that can be challenging. Also, in only a couple areas, especially KettleBowl, there is some confusing signage with IAT, snowmobile, and other trails all crossing and merging. Hi Hiking Dude - I stumbled across your blog as I am starting to put together a plan to through-hike the Superior Hiking Trail, probably in 2016 or 2017. You have some great information regarding your experiences - well done! The SHT looks like it is now open to Jay Cooke State Park on the south side - that's going to be my final destination, starting from the northern most point. I look forward to communicating with you as I plan my quest. Safe travels! @Dan - Best of luck to you in your preparations. I found going North to South made more sense to me.